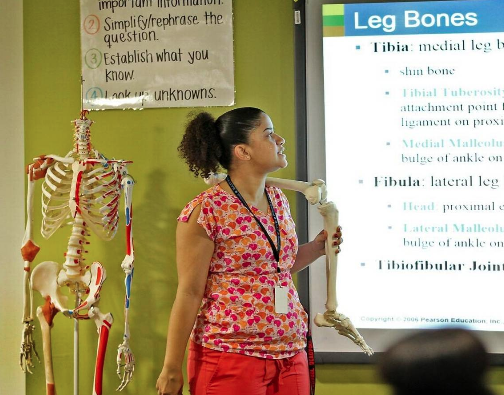 Teacher Desiree Chase delivers a lesson about the different parts of the leg at MAST Academy @ Homestead. Under Carvalho's proposed schedule, third grade English tests would begin on April 16 and run through April 23. Fourth through eighth grade tests would be administered April 23 through May 18. Tests are later this school year because of a new state law that recently went into effect. “It certainly makes sense to delay it one week to afford those additional days of academic exposure,” Carvalho said on Wednesday during a school board committee meeting. The district had already announced a later schedule for local testing and state exam make-ups. Several districts throughout the state were affected by Hurricane Irma, and some lost more days than others. Like Miami-Dade, Broward schools lost seven days of school. For the Keys, it was even worse. Some students on the island chain missed 18 instructional days. Carvalho argued that it’s not fair for some districts to have fewer days to prepare. Test scores are used to evaluate school performance on an A-to-F grading scale. Last school year, Miami-Dade public schools received no "F" grades, which Carvalho has lauded. A spokeswoman for the state Department of Education did not provide an immediate comment on Carvalho's letter. During its meeting next week, the Miami-Dade School Board will consider adding two more school days to the calendar because of the hurricane. The Broward school board has already approved restoring two planned early release days as full instructional days. Last week, Monroe County Public Schools Superintendent Mark Porter announced several changes to the school schedule in the Keys. Students will have a full day on Oct. 16, which was originally scheduled to be a professional day for staff. He also suspended all early release days for elementary and secondary students in traditional public schools until further notice. More days could be added in Monroe County, but the district hasn't made final decisions yet. “Clearly we need to restore some of this valuable instructional time we have lost. Our students deserve nothing less,” Porter said in a news release.